Hibernation is a state of inactivity, in which an animal's heart rate, body temperature, and breathing rate are decreased in order to conserve energy through the cold months of winter. A similar state, known as estivation, occurs in some desert animals during the dry months of summer. 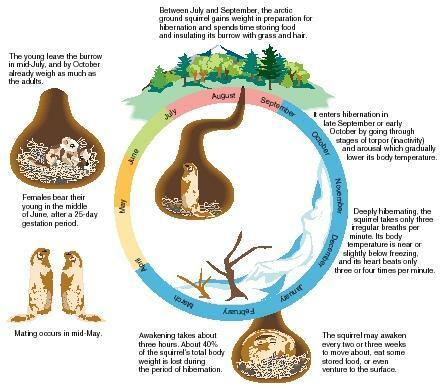 Hibernation is a technique that animals have developed in order to adapt to harsh climates. When food is scarce, an animal may use up more energy maintaining its body temperature and in searching for food than it would receive from consuming the food. Hibernating animals use 70 to 100 times less energy than when active, allowing them to survive until food is once again plentiful. Many animals sleep more often when food is scarce, but only a few truly hibernate. Hibernation differs from sleep in that a hibernating animal shows a drastic reduction in metabolism, and then awakes relatively slowly. (Metabolism is the process by which cells in an organism break down compounds to produce energy.) By contrast, a sleeping animal decreases its metabolism only slightly, and can wake up almost instantly if disturbed. Also, hibernating animals do not show periods of rapid eye movement (REM), the stage of sleep associated with dreaming in humans. Bears, which many people think of as the classic hibernating animals, are actually just deep sleepers. They do not significantly lower their metabolism and body temperature. True hibernation occurs only in small mammals, such as bats and woodchucks, and a few birds, such as poorwills and nighthawks. Some species of insects show periods of inactivity during which growth and development cease and metabolism is greatly reduced. This state is generally referred to as diapause, although when correlated with the winter months, it would also fit the definition of hibernation. Animals prepare for hibernation in the fall by storing enough food to last them until spring. Chipmunks accomplish this task by filling their burrows with food, which they consume during periodic arousals from hibernation throughout the winter. Most animals, however, store energy internally, as fat. A woodchuck in early summer may have only about 5 percent body fat. However, as fall approaches, changes occur in the animal's brain chemistry that cause it to feel hungry and to eat constantly. As a result, the woodchuck's body fat increases to about 15 percent of its total weight. In other animals, such as the dormouse, fat may comprise as much as 50 percent of the animal's weight by the time hibernation begins. A short period of fasting usually follows the feeding frenzy, to ensure that the digestive tract is completely emptied before hibernation begins. reaching rates of just a few times per minute. Their body temperature also drops from levels of 37° to 38°C (99° to 100°F) to 10° to 20°C (50° to 70°F). The lowered body temperature makes fewer demands on metabolism and food stores. Electrical activity in the brain almost completely ceases during hibernation, although some areas remain active. These areas are those that respond to external stimuli such as light, temperature, and noise. Thus, the hibernating animal can be aroused under extreme conditions. Periodically, perhaps every two weeks or so, the hibernating animal awakes and takes a few deep breaths to refresh its air supply, or in the case of the chipmunk, to grab a bite to eat. If the weather is particularly mild, some animals may venture above ground. These animals, including chipmunks, skunks, and raccoons, are sometimes called shallow hibernators. Arousal begins with an increase in the heart rate. Blood vessels dilate, particularly around the heart, lungs and brain, leading to an increased breathing rate. Eventually, the increase in circulation and metabolic activity spreads throughout the body, reaching the hindquarters last. It usually takes several hours for the animal to become fully active. If a groundhog is being fed reguarly will he still go into hibernation? I have outside cats I tend to feed and I cannot keep the groundhog away from the cats food. Infact, we have dubbed him Mittens becuase he thinks hes a cat and therefore deserves a cats name. We have tried to keep away from the feeding corral and have resorted to feeding the the cats in our garage/ shed in which he has resorted to eating the door to get in. My question is will he ever go to into hibernation. We are in our 2nd week of October in Ohio and are experiencing cooler weather and he is still bellying up to the bar so to speak. Can animals decline hibernation?